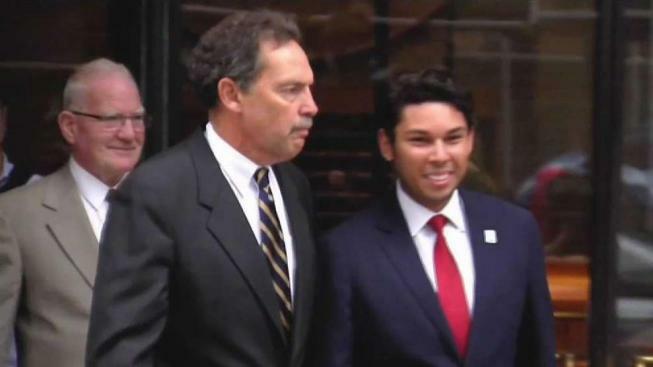 A Massachusetts mayor who was first elected at age 23 was charged Thursday with using investments in a company he formed as his "own personal ATM'' to enjoy casinos and adult entertainment, buy a Mercedes, and pay down student loan debt. Correia faces nine counts of wire fraud and four counts of filing false tax returns, U.S. Attorney Andrew Lelling announced Thursday. Special agents with the Federal Bureau of Investigation, Internal Revenue Service and U.S. Department of Housing and Urban Development assisted in his arrest at his home early Thursday morning. Despite being in handcuffs, Correia was all smiles as he pleaded not guilty to the federal wire and tax fraud charges Thursday. Outside of Moakley Federal Courthouse afterward, he called the allegations "bogus" and said he will not resign as mayor. Later in the day, Correia issued a statement proclaiming his innocence and reiterated he is not planning on resigning as mayor. Correia maintained his innocence late Thursday night, saying in a tweet in part, "I want you all to know that I am innocent of the allegations + charges made against me today." To the great residents of Fall River, I want you all to know that I am innocent of the allegations + charges made against me today. I look forward to my day in court! And thank you to everyone who has reached out offering your support! The 26-year-old mayor founded an app in 2012 called SnoOwl, which was marketed to investors as a way to connect local businesses with targeted consumers. Correia allegedly courted investors for funding in return for equity in the company, then used the funds for his personal gain while misleading his investors about the progress of the app as the company floundered, prosecutors say. Correia denied those accusations in his statement. "The SnoOwl app was completed and approved for downloading from the Apple App Store. At no time did I ever mislead our investors," Correia said. "I look forward to my day in court to share my side of the story and to clear my name." Prosecutors allege Correia stole at least $231,447 from seven investors in SnoOwl. The money was used to fund Correia's "lavish lifestyle," which included buying tens of thousands of dollars in designer clothing and jewelry, along with paying down his student loan debt, making charitable donations in his name and funding his political ambitions, federal authorities said. Authorities say he also filed false tax returns as soon as he learned he was under federal investigation. "Mayor Correia has brought undeserved shame and embarrassment upon the city of Fall River," said Harold Shaw, the FBI Special Agent in Charge for Massachusetts. "He betrayed the trust of his investors and betrayed the trust of his constituents." Running on a platform promoting economic growth and development, Correia was a city councilor when he was elected mayor in 2015, becoming the youngest mayor in the city's history. He defeated former Bristol County District Attorney Sam Sutter, who became Fall River's stand-in mayor for nine months following a vote recalling Will Flanagan. Correia attended Providence College in Providence, Rhode Island, and in 2014 was named entrepreneur of the year by the Fall River Area Chamber of Commerce, according to his online biography, which called him: "A classic example of a Fall River kid made good." Federal authorities said that Correia touted his business acumen to voters as a reason for electing him as mayor. "Taxpayers deserve more from their elected officials," Lelling said during a press conference Thursday morning. Correia was recently among 10 Democratic mayors in Massachusetts who chose to endorse Republican Gov. Charlie Baker for re-election in November over Baker's Democratic challenger, Jay Gonzalez. MassLive reports that Baker's campaign has since removed the endorsement from its website and is donating $500 in contributions they received from Correia to the relief fund set up for victims of the Merrimack Valley gas explosions.